I shot this gigapixel photo in autumn 2018 from the top of the Eiffel Tower. Using an SLR camera and a variety of telephoto lenses, I shot a few thousand photos from both levels of the Eiffel Tower. 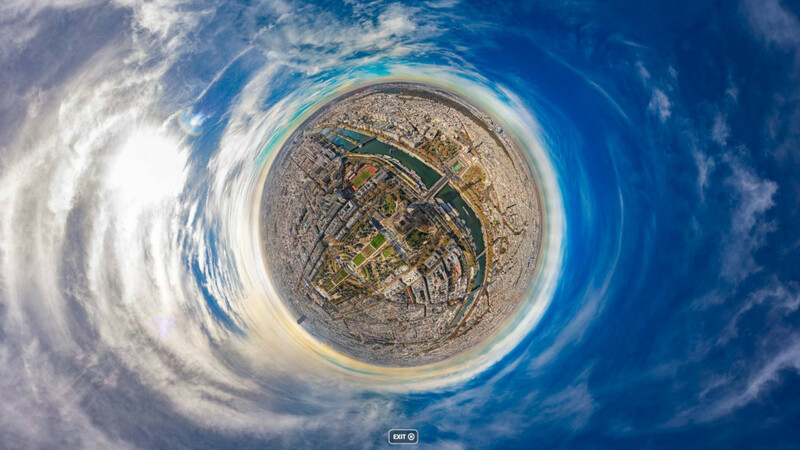 The image you see here was shot from the top level, and you can actually see the Eiffel Tower itself in the image. The Eiffel Tower, for those of you who haven't been there before, is an astonishingly huge bunch of cast iron, bolted together sometime in the 1800's. It is unbelievably large and tall for such a thing. No matter how iconic it is, no matter how many times you've seen it in pictures and movies, it doesn't fail to amaze with its sheer size when you're standing under it, or in it. I came to Paris to shoot this image. This kind of thing is a bit of a gamble, since the weather really makes or breaks the photo. Sometimes the air is thick with smog or clouds and the view is just not very nice. On this day, it was gloriously sunny and fairly clear. After three hours of shooting in every direction, I was thirsty, I had to pee, and I couldn't lift my arm anymore. But I got the shots! Post production of gigapixel images can take many months. This image, not being the biggest I've shot, was supposed to take only a few weeks, but as i shot it by hand, not with my trusty gigapixel robot, it took much longer than I expected and I actually had to scrap the whole thing after a couple months and start again from the beginning. Shooting by hand means that there can be holes, and I did have a few holes which I had to fill with different sets of pictures from different focal lengths shot at different times. The resulting finished photo does therefore have quite a few errors that shouldn't be there, but I couldn't do anything about it. Since I live in Europe, I'll simply have to go back there and shoot it again someday! At any rate, I hope you enjoy looking at this photo. I can't say that I've even seen every pixel myself yet at 100% resolution - it's that big. I'm always on the lookout for new places to shoot from; getting access to the top of a skyscraper in the middle of a city is extremely difficult, so if you have any tips, please get in touch!